I’ve been quite obsessed with graphic wallpaper. I love the bold statement it makes. And if there’s a place to be bold, it’s the entryway. The space should give visitors a sense of your style and say “Hello! 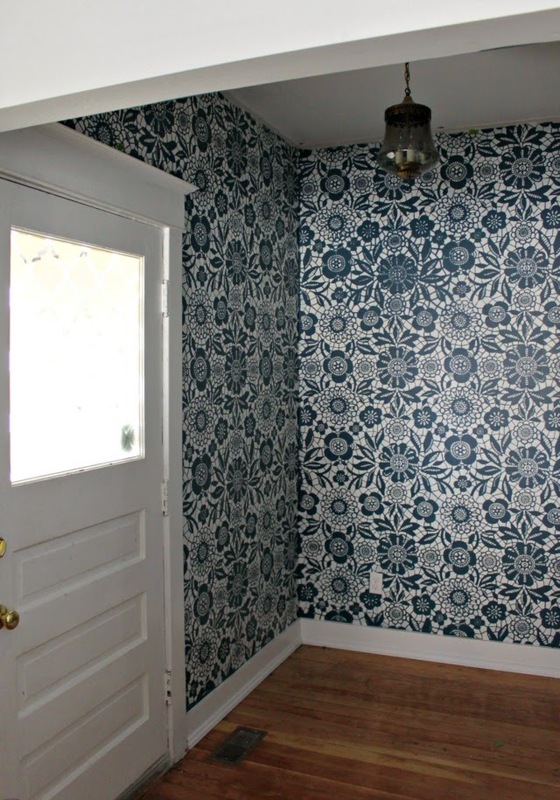 Come on in!”.But after pricing wallpaper and figuring out quantity needed I received a big reality check. 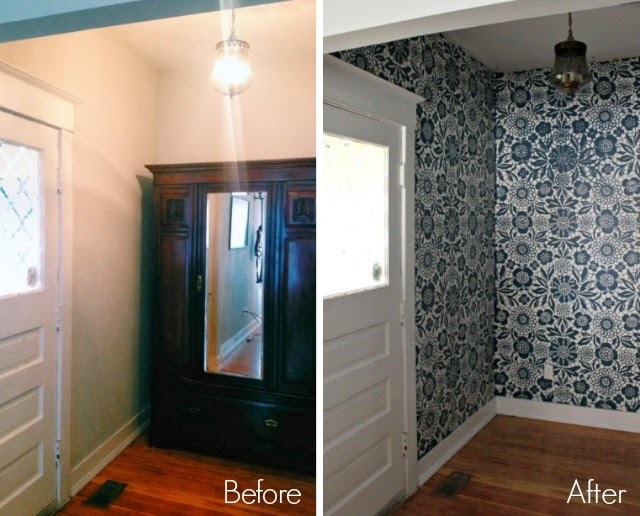 It would be over a $1000 to wallpaper this small space! So we went back to the drawing board and decided a stencil would do the trick. Well, a month later we’ve finally finished stenciling our entryway. It was hard, it was messy, but OH was it gratifying. 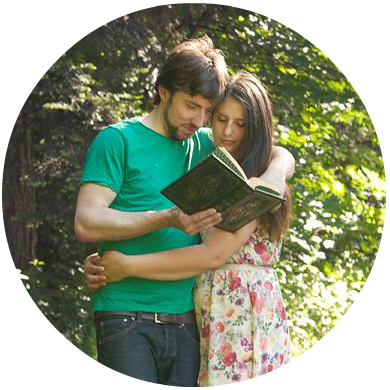 It took us about three days solid, and a week or two to build up our motivation and break through our frustration. The first 1/3 went quickly, then we took a break, didn’t wash our stencils well and the stenciling got pretty rough. We had to paint over some sections because the lines weren’t coming out crisp. Then we had our “duh” moment. The stencils had too much paint on them! After we took a rough brush and some elbow grease we got them looking and acting like new. The stencils were coming out just as good as before and the only thing left was to find enough time to finish the project! I just LOVE the look. 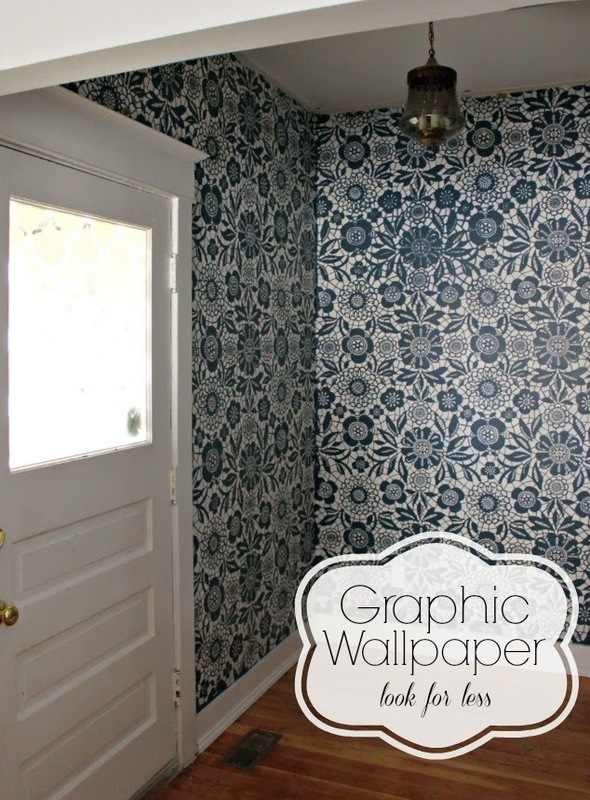 It gives the feel of graphic wallpaper without the price tag. 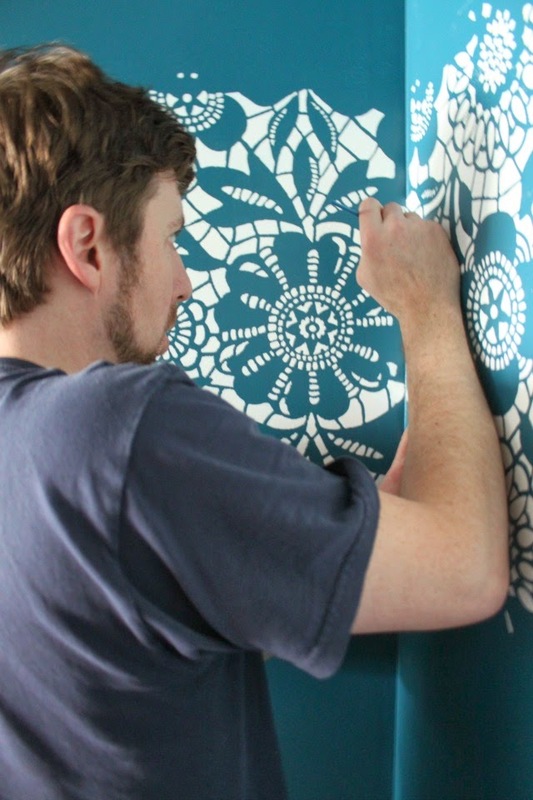 As frustrating as stenciling was, I can only imagine us trying to hang expensive wallpaper ourselves (not that I wouldn’t like to try it someday). If you mess up stenciling, the worst thing is that you have to paint over it and do it again. What helped me get through the project was one of this inspiration quotes found on Pinterest. “Done is better than perfect.” When stenciling, the whole is greater than the sum of its parts. I could have driven myself crazy trying to get everything to line up perfectly and look crisp! But then you step back, and it takes your breath away. Since a second coat of paint is cumbersome, and near impossible, the right quality paint is essential. Any water-based paint should work. 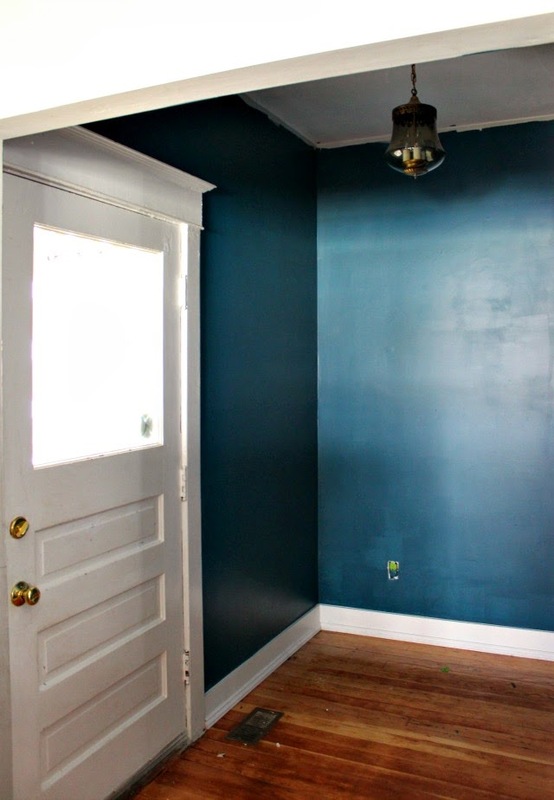 After some research, I found many sites recommending Ben by Benjamin Moore, which is what we used. I agonized over the right shade of teal, because like other paint projects, redoing this isn’t something I can talk my husband into. We selected Benjamin Moore White Dove and StlateTeal. Make sure to mix the paint well before using. Practice on a sample board first, if not, the application may vary and colors may not be consistent. 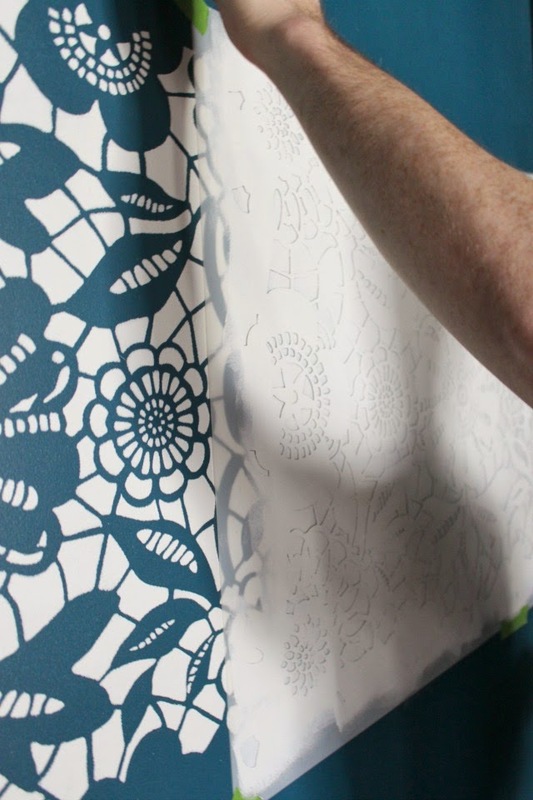 If stenciling over several days, wash the paint off the stencil before the end of the night, if not the paint will build up and make the stencil thicker, resulting in blurrier lines. In the end we found washing it every four stencils worked best. Our stencil package came with two patterns that worked together so we were able to wash and dry while using the other. For imperfect applications, I took a small brush and smoothed uneven lines. I had a designated brush for teal and white. I could have spent hours doing this if I had allowed myself. These brushes also came in handy near the baseboards and corners to connect the patter with a free hand. 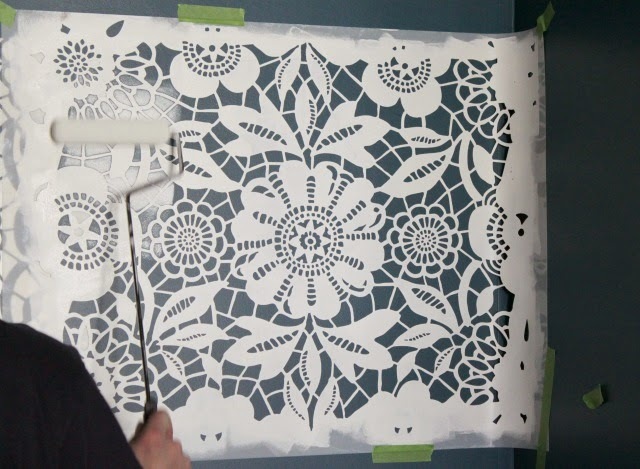 Stenciling is not easy, but with practice and patience the results are stunning and much more inexpensive than wallpaper. If anyone else has any other tips, please comment! Next, we add some pretty crown moulding, jacket hooks and style it up pretty… stay tuned! My first thought was literally, "oh, I guess she decided not to stencil after all and splurged on the wallpaper," per our convo last week. HA! Great job. Never would've known it was a stencil. This looks AMAZING! Wow. So so good. WOW! This turned out so good, I love it! So inspiring!